With an average rating of 2776, the first Norway Chess Tournament might be the strongest ever. May the 8th is the one day all the chess fans are waiting for. 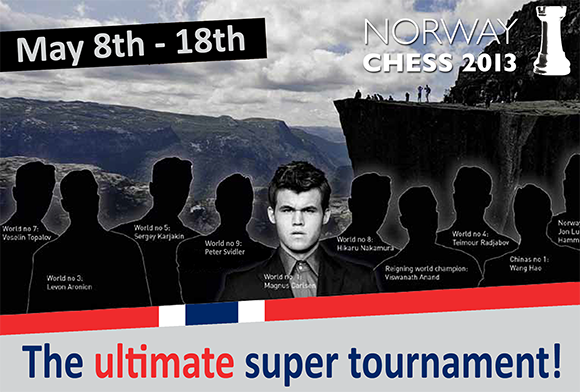 One of the strongest chess tournament ever is going to draw the fans' attention from May the 8th to May the 18th. The line-up is simply stunning, with all the 2750+ guys. 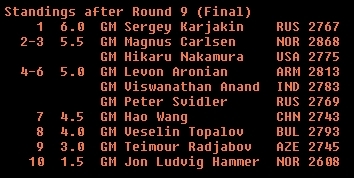 At the last minute, Vladimir Kramnik had to decline the invitation, but the uber-strong Peter Svidler stepped in, completing a list of participatns that until now existed only in any chess lover's dreams. ICC will cover this amazing event with Live Radio Broadcast, Game Of the Day Service and the traditional TRIVIA contests, whith main prize being a 1-year subscription to the best chess magazine out there: New in Chess! Games start at 9am EDT - 15:00 CET. Last Round 6am EDT - 12:00 CET.